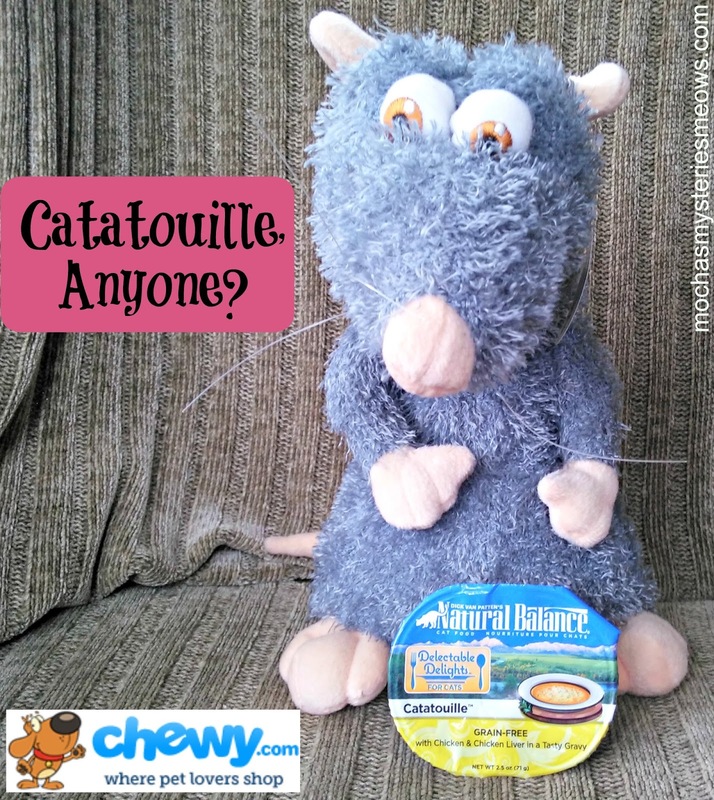 Are you a fan of the movie Ratatouille? Mommy says we need to watch it together someday because it's one of her favorites. Most likely I'll enjoy watching all those tasty looking rodents scurrying across the screen! 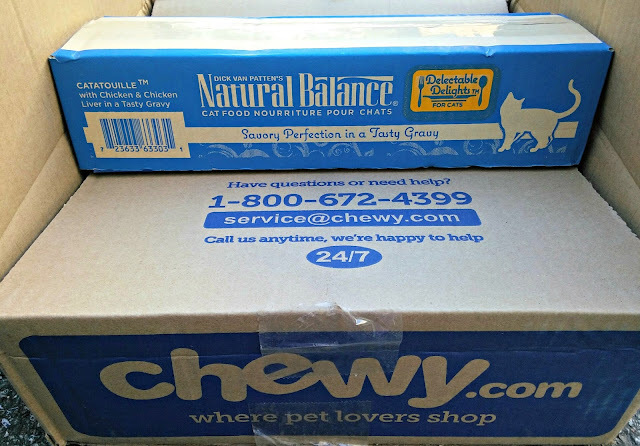 Natural Balance's Delectable Delights line is known for it's fun flavors such as O'Fishally Scampi and Sea Brûlée, so when we saw a flavor called Catatouille on the menu thanks to our friends at Chewy.com's Blogger Outreach program, I knew it was something I wanted to try. 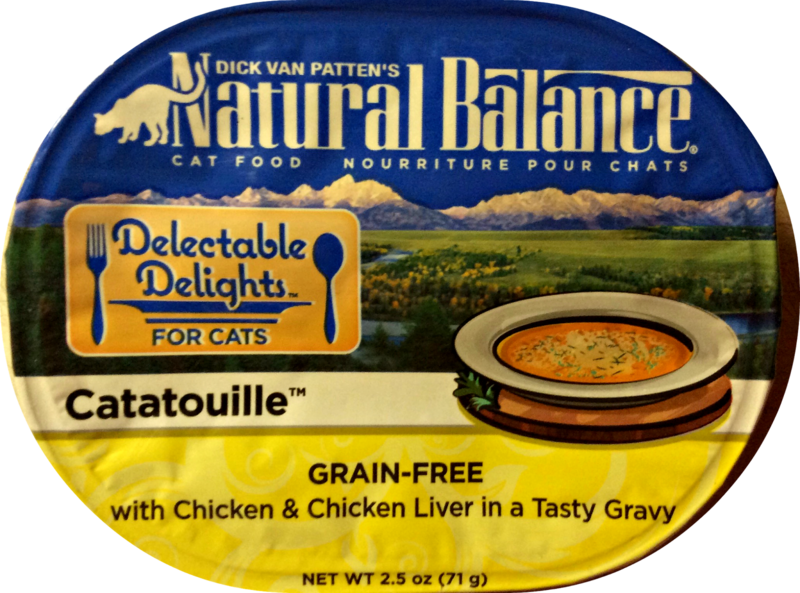 Natural Balance Delectable Delights are gourmet cat stews that are hand crafted and cooked to savory perfection. Catatouille Stew is made with chicken and chicken liver in a tasty gravy. When Mommy opened the tray she said it looked more like a fancy appetizer for humans than cat food! So what did I think? 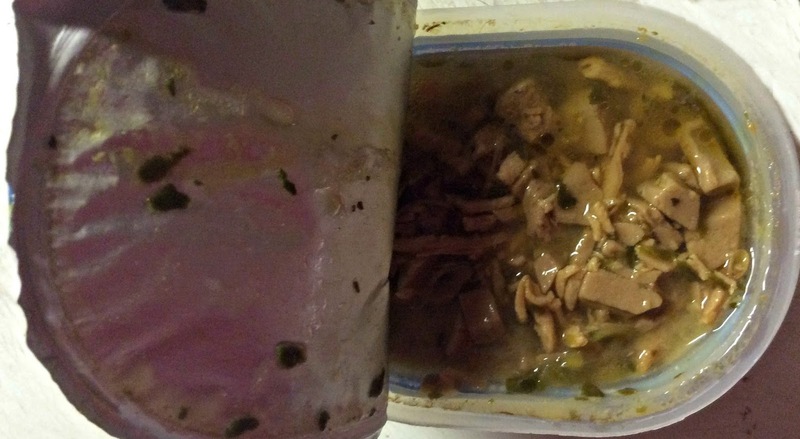 Well, I *loved* the gravy but I left the meat. Mommy says that seems to be pretty typical with lots of kitties but it's okay because more moisture in my diet is always a good thing. I would definitely recommend Catatouille to my gravy-loving friends, and at $10.32 for a case of 12 it's a really great deal right now too! My momma likes dat movie too. Did you say it had mice in it? No? Oh - Simon would love this food - he loves gravy!! Sitting down to eat is a good sign around here, too. 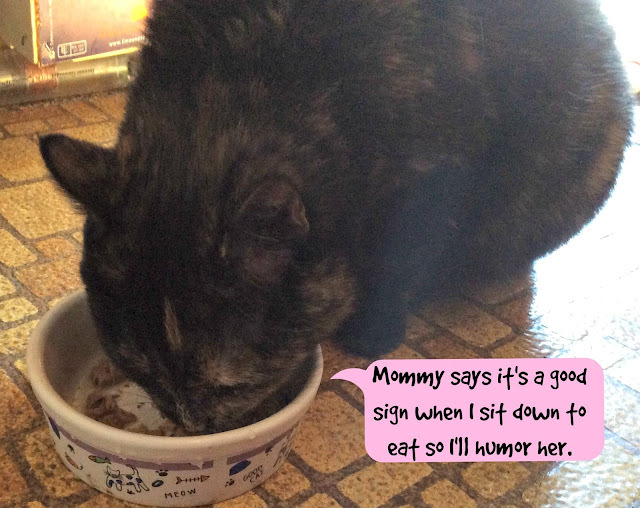 And, eating only the gravy is also typical of the kitties around these parts. I'm glad you liked it, Mupdie! Thanks for sharing this great review with us! Purrs! We are glad that you enjoyed the gravy! Sadly we can't eat Natural Balance as it upsets Dragonheart's tummy. He has a very fussy tummy. We're Natural Balance Platefulls nommers ourselves. Good choice! We love the NB Catatouille! We do lick all the gravy first, but we eat all the meat eventually. Catatouille--what a cool name! We favor da gravy ourselves and don't blame you a bit, Mudpie! 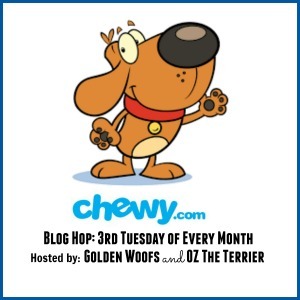 We would buy it just for its fun name! That looks better than the green moldy looking stuff I got. TW just remembered she hasn’t given it to me yet. After she skims the green off, I’ll prolly lick the gravy too. Pop watched that movie but TW hasn’t despite the fact that I want to see it. We cats had reviewed a different flavor of Delectable Delights last week. Yummy. My kitties love that food too. 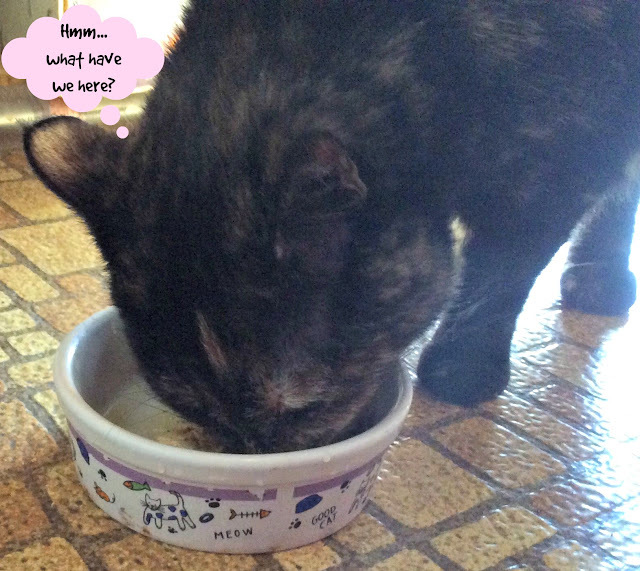 Actually, we dogs love it as we found out when Mom put the food in the cat bowl, went to get the cat, and Bailie ate it all in one big bite!